I must say I don’t like the line being called after Ron Barassi – better to name it after a footballer who lived on the line and played Australian Rules on Saturday and Rugby League on Sunday – such as Eric Kuhn originally from Weethalle or Jim Keys from Gibsonvale. So I’m calling my line the Jim Keys line. The method was to explore the frequency of use of the terms “Rugby League” and “Australian Rules” in association with various towns, villages and localities in the National Library’s Trove database of newspaper articles. The database covers the period 1920-1954 – so what I’m seeking to draw is an historical border, one set back in Maher Cup days. There’s a summary of individual town and village findings below , but this is how I would draw the line through the state as follows. 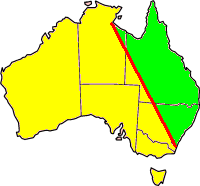 Starting in the outback between Wilcannia and Broken Hill, Menindee falls into Rules country while Ivanhoe played League. 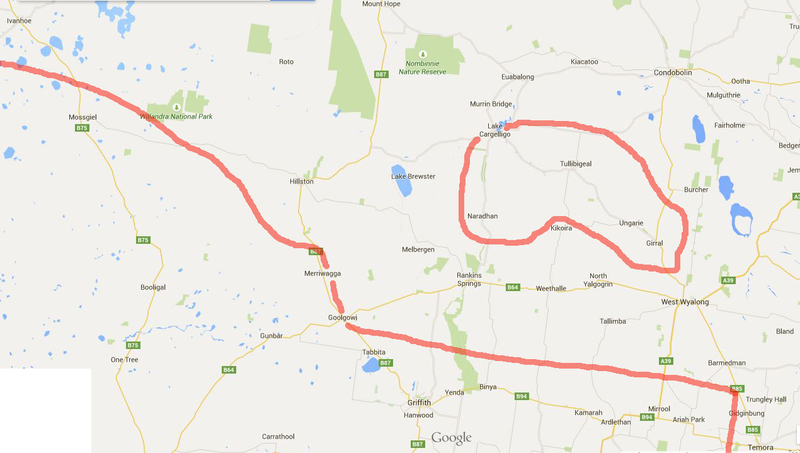 The border then flows between Ivanhoe and Mossgiel, just west of Hillston, cuts through two places right on the line – Merriwagga and Goolgowi, and then runs south of the Barmedman to Rankins Springs rail line until it hits the road at Reefton – midway between Barmedman and Temora. From Reefton the line turns almost due south and crosses the Ariah Park-Temora road and comes up close to Junee east of Marrar. Curving towards the south-east it crosses the Sturt Highway east of Ladysmith – placing Wagga firmly in Australian Rules country. Heading towards the hills the Hume is traversed between Tarcutta and Kyeamba, while Carabost and Tumbarumba lie on either side. 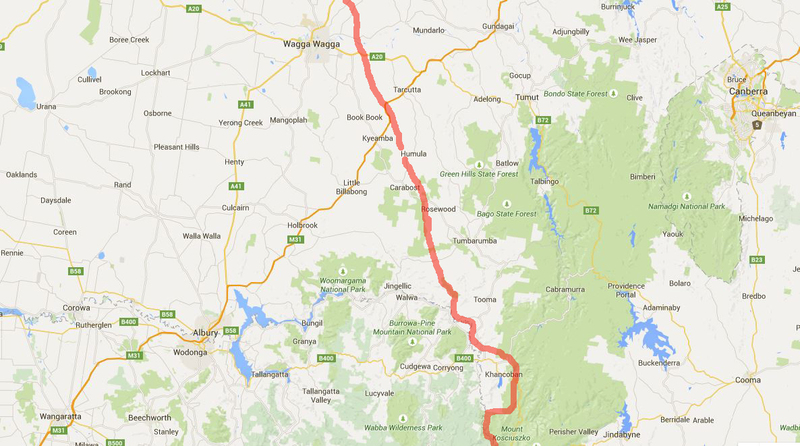 It finishes by aligning with the political border through the mountains and down to the coast. However it’s not quite so simple. North-west of West Wyalong along the road to Lake Cargelligo was an island of Australian Rules including localities such as Girral, Ungarie, Weja, Tullibigeal, Burgooney and Naradhan, with ‘The Lake’ itself being a 50/50 town. Down south of Wagga, in solid Aussie Rules territory, Lockhart was another 50/50 town, while Henty and Holbrook had strong League followings. The Murrumbidgee Irrigation Area fell below the line, but the Victorian game was not as dominant as it was in the smaller towns and villages of the wheat belt to the east – Coolamon, Marrar, Ariah Park, Ganmain, Grong Grong and we shouldn’t forget Matong. The above can be partly explained by the difference between town and country. 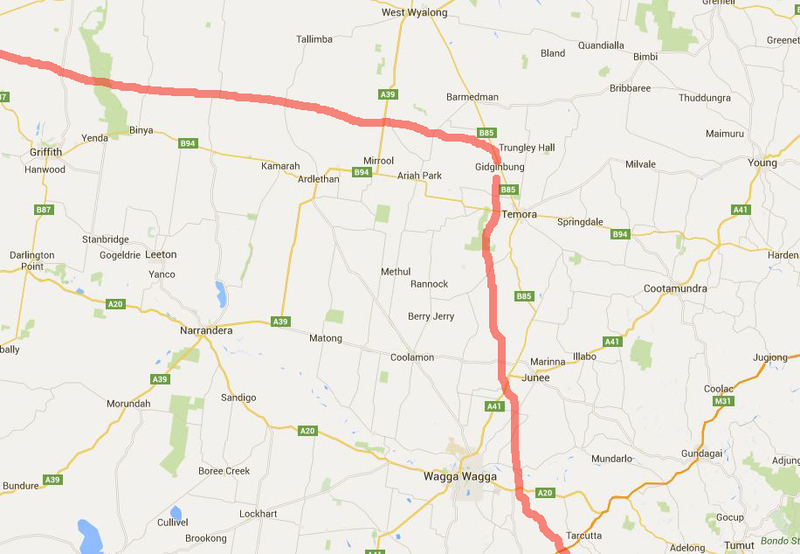 Around the Jim Keys border, town dwellers tended to have settled from the east (Rugby country), while between the 1890s and 1920s thousands of farming families came up from Victoria (and some also from South Australia) to take up closer settlement blocks in the wheat and sheep country which opened up as the rail lines were built. Thus the more rural the area the more likely it was to be a Rules place. Where League grounds were usually in town and close to a pub, there were many Australian Football teams that played on a stock route or paddock cleared by (and often owned by) local farmers. They could only dream of a pub. 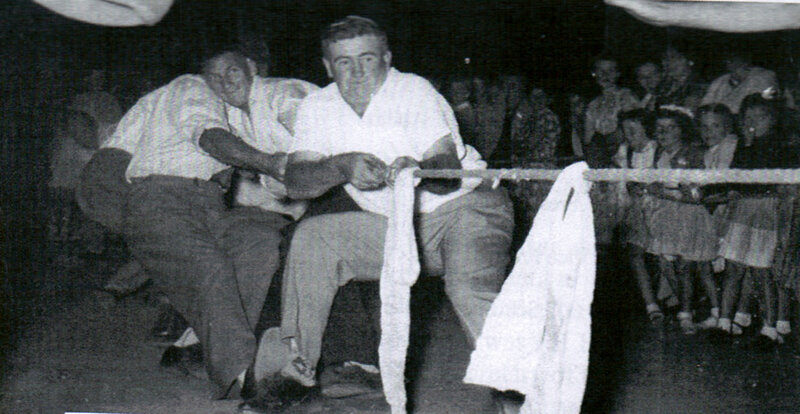 Such teams included Four Corners near Kikoira, Sandy Creek between Weethalle and Tallimba, Kildary south of West Wyalong, and to the southwest of Temora – Winchendon Vale, Rannock and Bectric. Whether or not the line has moved from Maher Cup days, I don’t know. I’d be very interested in your thoughts. The following has largely been taken from Sporting Champions of the Bland written by Patrick O’Kane (1994). Jim Keys was a Maher Cup footballer for Gibsonvale. He became the foreman at Gibson’s tin mine but originally came there to work for a farmer who engaged him partly as a worker but also to play Australian Rules for the local team. Keys also became a champion cricketer, tennis player, golfer and lawn bowler. He played cricket for NSW, represented Northern Riverina in Australian Football (along with Jim Daniher) in 1947, when they defeated Perth team Subiaco. Jim found that Rugby League was hard on his body so he retired aged 35. He kept playing Aussie Rules until 40. In tennis over 20 years he won some 32 double championships with his mate from out at Kikoira, Terry O’Kane. His party trick was to play an opponent using a frying pan. Taking up golf at West Wyalong aged 40 he found it difficult – only getting his handicap down to 12. At 50 lawn bowls was the next challenge and he won tournaments all over the place. Oh, and he was useful on the tug-o-war team too. This entry was posted in Demography, Communications & Media, Places and tagged Australian Rules, Jim Keys. Bookmark the permalink. I have lived in Albury my entire life and I that classifying it as “Australian Rules was the dominant code but significant Rugby League presence” is a stretch. I can recall the number of times I have seen rugby being played on one hand. If i had to assign a ratio to it I would say that its 95:5. Perhaps even more. Hi Foster. That sounds right to me too. Maybe Albury came up stronger in my survey than it should have because Group 13 finals were often held there. For example in 1946 Lockhart and Holbrook were the finalists. They were considering Henry (which also had strong RL team then) as the neutral venue, but chose Albury because they thought they would get a bigger gate. Of growing concern is the recent slow death of the terms “Aussie Rules”, “Rules” and even its real name, Australian Rules Football and their replacement with the term AFL. I’m sorry, but unless your little prodigy is an absolute freak he doesn’t play AFL, he plays Aussie Rules Little League, your cousin doesn’t play AFL, he plays Aussie Rules for the local seconds. If your Kiwi neighbour doesn’t say he plays NRL or Bledisloe, but instead says he plays League or Union, and the Italian kid up the street doesn’t say he plays EPL, he says he plays soccer, then why does everyone who kicks a wobbly drop punt think he plays AFL? And just on the soccer thing, yes I know it is the world’s most popular code, but so what? It is NOT the most popular code in all regions of the world. Each region’s dominant code gets to take the generic name “football”. In the US it means Gridiron, in NZ or Sth Africa it means union, below the Barassi line it means Rules, above it means League. In none of those places does it mean soccer. Got nothing against soccer, (except for it being boring), it can co-exist but needs to respect its place. Great rant Peter. Ta. I can see that we share a pedantry regarding the minutiae of sport. Roy & HG would be proud. I just can’t believe anyone would call this the Barassi Line. Why him. Ridiculous!